What is a herb? 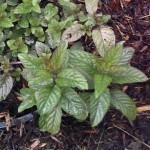 Most people regard a herb as a special type of plant, part of which is used in cooking to add another flavour or help emphasise one already there. However, when you begin to think about it, the word can cover a very wide range of plants — one could say that all herbaceous plants are herbs. The dictionary or botanical definition of a herb is: ‘any plant with a soft or succulent stem or stems that dies to the roots every year’, but in general any herbaceous or woody plant which is aromatic in one or more of its parts and which is considered to have culinary, medicinal or cosmetic value, can be regarded as a herb. Herbs can be classified in a variety of different ways and any one or more of these can be pursued if the herb virus gets a hold of you. You can devote yourself to making as complete a collection as possible of the herbs used in cooking. Suggested kinds to start with are the big five: parsley, mint, thyme, chives and sage; from these you can expand to include marjoram, garlic, fennel, rosemary, sorrel, tarragon, angelica and the savories. From there you can go on to the herbs used in making teas, wines and drinks in general — there is no end to the ways in which the cook can make use of herbs. sure that you are using the right plants. The plant family Umbelliferae contains several herbs, which are rather alike in general appearance, including hemlock which of course provides a deadly poison! It is interesting, though, to discover the old plants that were once much used by doctors; many were useless but a few were effective, and the foxglove for instance is still grown to provide digitalin for use in heart complaints. The autumn crocus (Colchicum), comfrey, betony, aconitum, poppy, and belladonna are also all considered to be medicinal herbs. Some- people prefer to collect plants in botanical groups, and herbs lend themselves rather well to this; for instance to take the family Umbelliferae again, it contains a good many useful herbs such as lovage, fennel, coriander, and dill, and the Labiatae is another, with basil, balm, hyssop and marjoram counted among its members. Each family can have a bed devoted to it, and it is easy then, and rather surprising, to see how widely plants can differ within a family in habit, shape of leaf and even apparently in flower, though a trained botanist will be able to pinpoint the similarities on which the classification is based. Collections of this kind can be seen at Kew, Cambridge and the Chelsea Physic Garden – the last mentioned is, however, only open for students and professional use. Another way of collecting herbs is to grow only those which are pleasantly aromatic or perfumed; this would of course mean no parsley, no garlic, no savory and so on, but it does leave room for quite a lot more plants, such as lavender, thyme, lemon balm, basil and mint. Some need bruising before releasing their fragance, and growing them on paths or at the edges of beds close to paths, will ensure the necessary pressure. wheel. 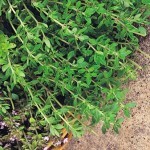 The carpeting herbs can take the place of paving, such as creeping thyme or chamomile, if paving is unobtainable. you plant nepeta (catmint) — the peace will not be quite so absolute, as the cats tear it to pieces in their attempts to become one with it. However you decide to lay out your herb garden, try to design it on paper beforehand. Then you can be sure of blending the colours of foliage and flowers, and avoid the mistake of planting tall herbs in front of the mound-forming kinds. Some herbs have beautifully coloured leaves; others have an architectural habit of growth with handsomely shaped leaves; some die down completely in winter, others have attractive flowers and all this should be taken into account when designing a herb garden. One needs to know, too, the amount of space a plant will take up in girth as well as height. 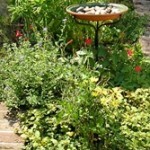 Make sure that herbs which like the same conditions of growth all grow together. An even more elaborate form of herb garden is one laid out as the Elizabethan knot gardens used to be. These consisted of intricate arrangements of small beds separated by low growing hedges, or paths of coloured stones or sand. Box (Buxus suffruticosa sempervirens) makes a good low dividing hedge, though not considered a true herb; others are santolina (lavender cotton), sage or artemisia. There is a typical Elizabethan knot garden laid out at Hampton Court, and another at New Place, Stratford-upon-Avon. For those who would like the effect of a lawn in a herb garden, a good substitute for grass is chamomile, which will stand a certain amount of walking on, and will not need much cutting, perhaps three or four times during spring and summer. It makes a good green carpet, as do also creeping thyme, penny-royal and the creeping mint Mentha requienii. Paths within the herb garden can be covered with these plants as an alternative to paving or bricks; walking on them will help to release their aromatic perfumes, as the leaves and stems are bruised by the pressure. Three famous herb gardens which will give you an idea of what can be achieved are those at Sissinghurst Castle, Knole near Sevenoaks, and Lullingstone Castle, near Eynsford, all in Kent; they are open to the public and the first two are National Trust gardens. Besides growing herbs in their own garden, they can be given a separate border, like a herbaceous border. The same principles of design will apply to this as to the herbaceous kind, in that tall plants are better at the back, and plants should be grown closely enough to prevent weeds establishing themselves. Good front-of-border plants are things like the golden-leaved marjoram, chives, parsley and thyme. The rounded, bushy, middle-of-the-border plants are hyssop, sorrel, lemon balm, pot marjoram, tarragon and verbena, and for giving height and architectural quality, angelica, fennel, and lovage can be used. Facing the sun, and with a tall hedge as backing, a herb border can look very ornamental as well as being useful, particularly if some of the medicinal herbs are included, such as foxglove, lily of the valley and poppies whose flowers are more showy than those of the purely culinary herbs. Since the majority of herbs are grown for cooking, another good site would seem to be the vegetable garden, giving them a permanent small border to themselves, alongside the vegetables. The perennial herbs will obviously stay in the same place for some years, but those which are annual and are grown afresh from seed every year, will need freshly prepared soil each year, and so take a little more time and attention. Still, this can be done at the same time as the ground is prepared for vegetable sowing. Herb seeds are sown in drills, and thinned, as vegetables are, and will need hoeing to remove weeds, and watering in dry weather, with occasional applications of liquid fertilisers. Try to make sure that a part of the vegetable garden is chosen which supplies the conditions of sun, shelter, and well-drained soil mentioned previously. Obviously, one of the best places to grow cooking herbs is as near the kitchen as possible. There is nothing more irritating than getting halfway through a recipe and discovering that you have forgotten to pick the particular herbs needed for it, and then having to go to the end of the garden for them. It is always a dark night, pouring with rain, when this happens, and it is terribly tempting, then, to do without. At least if they are just outside the backdoor, they are quick to get if you have forgotten to pick in advance. An even more convenient way to grow just a few different kinds of herbs is in the form of ‘mobile’ herbs, that is in window boxes, pots, hanging baskets and miniature gardens. They can then be moved about and given the best possible position for light and sun. Soil mixtures, feeding and watering can be tailored to fit their requirements exactly, and it ensures that garden-less cooks can not only have their own home grown herbs, but can also have them at any time. Quite a few herbs which will not survive our winters out of doors can be retained all the year round in this way. Balconies, outer window sills and roof gardens can be pressed into use; inside window ledges which get plenty of light are excellent.